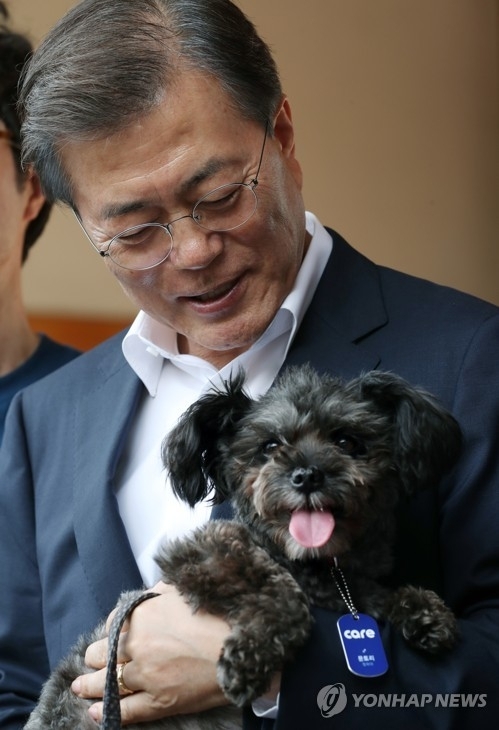 SEOUL, July 26 (Yonhap) -- South Korean President Moon Jae-in has officially adopted a homeless dog as a presidential pet, his office said Wednesday. Moon received a rescue dog named "Tory" from the animal rights group Coexistence of Animal Rights on Earth (CARE) after signing an adoption agreement, the presidential office Cheong Wa Dae said, adding that this is the first time that a shelter dog has become a so-called "First Dog." The four-year-old black mongrel joins Moon's two other pets -- a Pungsan dog called "Maru" and a former shelter cat named "Jjing-jjing." Moon, during his campaign, promised to adopt Tory as a presidential pooch after visiting the animal shelter. Tory was rescued from a dog meat farm two years ago, but wasn't welcomed by would-be adopters because of prejudice against black dogs. Moon then said he wants to remove the stigma surrounding them, and will adopt Tory to show his belief that both humans and animals should be free from prejudice and discrimination. Following the adoption of Tory, Moon called for making a society where people and abandoned animals can co-exist since now more than 10 million people raise animals from shelters. "About one million animals find new owners, but 300,000 are abandoned each year," he said. "We need to pay more attention to abandoned animals and care for them as a society."